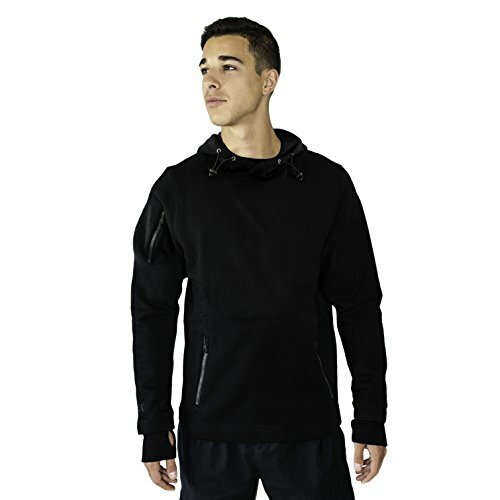 The Merino Wool Hoodie You Can’t Leave Home Without! unprepared in an emergency, but trying to run with them is a hassle. securely holds your phone, keys or wallet without getting in your way during exercise, and provides you with a music portal so you never miss a beat. tri-panel hood design, it’s incredibly versatile and provides the perfect fit. Why Choose Our Grizzly Sweatshirt? Order Your Hoodie Now and Carry the Essentials! WARMEST HOODIE OUT THERE: With our Grizzly black pullover hoodie, we've perfected the grab-and-go sweatshirt! The outer layer of 400g Merino Wool is your first line of defense against harsh wind and freezing temperatures while ultra-soft merino fleece offers an extra layer of insulation. FIT & FUNCTIONAL: Featuring a sleeve pocket for your phone or keys with a music portal for your iPod, our hoodie sweatshirt is ideal for jogs and hikes! Design details like cuff thumbholes and a kangaroo pouch add extra warmth when your hands need it most. BACK TO BASICS: From brisk autumn days to winter layering, our casual hooded sweatshirt is a must-have in every man's closet! Available in a classic black and featuring a tri-panel hoodie design for a flattering fit, the Grizzly offers breathable merino wool comfort that's great in any season. EASY CARE FABRIC: We love Merino Wool Clothing because it naturally wicks moisture, meaning it resists odors and won't become damp! Paired with premium merino wool fleece, you're truly treating yourself to the best. As an added bonus, our men's black hoodie is washing machine safe. SATISFACTION GUARANTEE: Why wait any longer to grab your new favorite merino wool sweatshirt? We're so confident in our pullover hoodies for men that each one comes with our money back guarantee! If you're not fully satisfied, let us know and our team will refund the order. If you have any questions about this product by WoolX, contact us by completing and submitting the form below. If you are looking for a specif part number, please include it with your message.